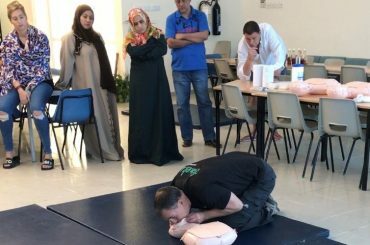 If you are presented with a casualty who is unresponsive and not breathing normally, would you give them the kiss of life? By kiss of life, we mean mouth-to-mouth resuscitation. We follow the European Resuscitation Council Guidelines. The most up to date guidelines promotes the use of rescue breaths as well as chest compressions. In adults the ratio is 30 compressions followed by 2 rescue breaths. With children, 5 rescue breaths first followed by 30 chest compressions, then 2 breaths and so on. The topic of administering rescue breaths regularly turns into a (healthy) debate during our training sessions. Some participants tell us they’ve been told by other training providers, that they are not to administer rescue breaths. When we deliver training in the Middle East, cultural differences are discussed for example is it appropriate to help in this way. In our opinion, administering both chest compressions and rescue breaths is the best method to adopt. Moreover, use of an Automated External Defibrillator with CPR further increases the casualty’s chances of survival. However, there are certain circumstances where it might not be possible to give rescue breaths. For example if the area around the casualty’s mouth has been severely damaged. It also boils down to the individual first aider’s choice. If you really do not want to, or feel that you cannot give rescue breaths; then doing at least chest compressions will help. Furthermore if someone is there to assist you, ask if they will give the breaths. As we say to all of our learners, it’s better to do something than nothing at all. Learn CPR on one of our First Aid courses. For more information, please get in touch.